Dedicated players of games like Monster Hunter: World might feel burned out after spending so much time in the game, while players curious about the genre might be intimidated by World’s complicated gameplay. 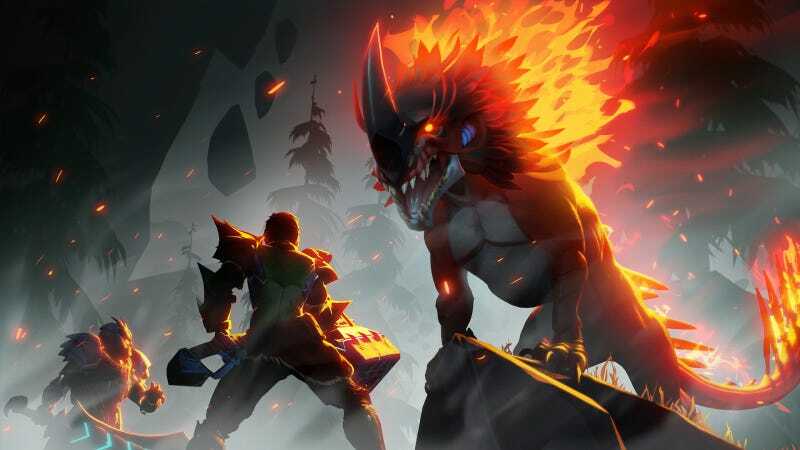 Dauntless is an upcoming free-to-play monster hunting game that looks to help both types of players scratch their itch for tough monster battles. Developed by Phoenix Labs, Dauntless is a more colorful take on the classic monster hunting formula. Instead of a deeply realized ecosystem, it opts for a cartoonish science-fantasy world of floating island, airships, and magical beasts. You play as a Slayer, a professional who wanders the wasteland to fight dangerous beasts. You’ll collect supplies, craft weapons and armor, and work your way through a series of increasingly difficult creatures. It’s a comfortable core loop: head out, fight, come back, craft, head out, and fight some more. There’s a handful of weapons to choose from, including swords and hammers. When I played this weekend I used the chain blades. I could swing the blades around for wide sweeping attacks, or hack and slash up close using a few basic combos and special attacks. The moveset was as acrobatic and satisfying as using my dual blades in Monster Hunter: World. The monsters ranged from a fast lion with literal fire for a mane go a rock-covered lizard whose defenses were a pain to crack. The core monster hunting experience of Dauntless is solid, and I was genuinely curious to see what challenge would come next. Dauntless releases later this year and has some hurdles ahead of it. The open beta servers struggled to accommodate a large influx of curious players, and the prominence of an in-game shop where players can spend premium currency for items is disappointing. Crafting new armor is a streamlined process, at least in the beta. This means getting what you want sooner, but it also diminishes the feeling of embarking on a hunt to find specific pelts or feathers. If you push through these hurdles, Dauntless can be a ton of fun. Quick matchmaking makes it easy to embark on the hunt of your choice, and each new creature provides challenge. Players eager to check out the monster hunting genre with a lower barrier of entry than Monster Hunter: World should be pleased. Dauntless has a lot of potential. Also, there’s a lighting lizard and a freaky beaver monster. Enough said.